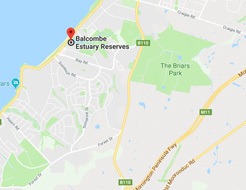 Declared in 1987, the Balcombe Estuary Reserves cover 76 hectares of bushland between the Nepean Highway and the Mt Martha coastline. Managed by Mornington Peninsula Shire, they protect the largest unspoilt estuary on the eastern side of Port Phillip Bay. Balcombe Creek, which flows through the Reserves, begins at the back of Mt Eliza. It flows through Baxter and the Moorooduc plain, before it is joined by Devilbend Creek and turns westwards towards Port Phillip Bay. In its lower reaches, it flows through The Briars historic park, then the Balcombe Estuary Reserves, entering the bay at Mt Martha. 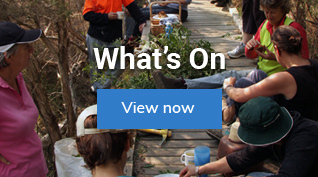 A network of walking trails up to 3.5km long, including a boardwalk along the Creek, allow people to explore the variety of original bushland reserve types and observe a variety of indigenous flora and birds. The walking trails also link under the Nepean Highway to The Briars historical park, which has its own network of walkways. The park can be accessed by car from the western end at the Campground car park, from the Augusta St bridge, the Uralla Drive bridge and from the corner of Nepean Highway and Uralla Drive. The Reserves have several different types of bushland reserve. These include Coastal Banksia Woodland, Manna Gum Woodland, Swamp Scrub, Aquatic Herb Fields, and Saltmarsh. Dogs are expected to be on leash in most areas, but there are leash-free areas at Citation Oval, Ferrero Oval and the ‘Soccer field’, near Nepean Highway. 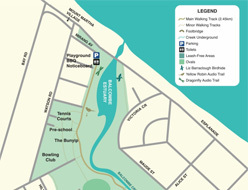 It is possible to canoe or kayak up part of the Creek, but the Shire’s policy of natural systems results in fallen trees remaining in the Creek, reducing the ability to canoe or kayak beyond Augusta St bridge. Wetland birds that graze and roost about the estuary include Egrets, Spoonbills, Cormorants, Pelicans, Ducks, Water Fowl and Herons. Among the native fish species in the creek, is the nationally threatened Dwarf Galaxia. Lizards, skinks and frogs find shelter among fallen logs and low plants. Woodland birds range from tiny Wrens, Thornbills, Honeyeaters, Mistletoe birds and Robins, which thrive in the dense undergrowth, to Rosellas, Kookaburras and Goshawks. Mammals to be seen include echidnas, sugar gliders, swamp rats, several tiny bat species, possums and an occasional koala.